Some of you may remember my Instagram post from a few months back about my friend, Donald. Donald was one of the first people I met when I moved to Detroit a little over three years ago, and he’s been a somewhat regular character in my life. Donald’s usual place of residence is sitting outside on the small curb that is tucked beside Slows BBQ and next door to Astro Coffee in Corktown. He will usually have an old coffee cup in hand, most likely the coffee a regular bought him at Astro that morning, and upon finishing the contents it would become his “work” cup as he asked for change throughout the day. Donald’s other “jobs” include holding parking spots, helping people parallel park in front of the businesses, directing those with less than admirable parking abilities, and reminding people when/how to use the pay station so they won’t get a parking ticket. I met Donald the morning of my birthday three years ago. I had just moved to the city, and on my birthday I decided to drive to Astro for a latte and a breakfast treat. I had no intention of staying long, but running in and out so I could get home to enjoy some quiet time without my roommates and rest a bit before my family would come down for my birthday party. I had my timeline of the day all mapped out. I had my music going and windows down, because it was that perfect fall day in October for driving on the highway; the kind of day that feels like you’re in a movie and the most epic soundtrack is rolling over your life. It was that kind of day. I turned around and a few feet in front of me, tucked in the little pocket by Slows, there was Donald. He had a bandage wrapped around his head, rips all over his jeans and long sleeve shirt that was covered by a stained grey tank top, and old work boots that seemed tattered from enduring the salt and snow the winter before. We all have that conversation in our heads when we are approached, mine used to always sound something like this, “Keep walking. Look down, don’t make eye contact. Act like you didn’t hear them. It’s okay just say hello but that you have no money. Do I have money? I don’t know but I’m not giving it to him. Why shouldn’t I give it to him? Okay, it’s day light I’m safe. Are other people passing by right now? I’m already late to get home and I have things to do. If I get stuck talking how will I get out of the situation?” That used to be the split-second conversation I had with myself. But that conversation I had in my mind had drastically changed months prior to meeting Donald. Instead, I walked over and asked a simple question. That’s it. Nothing more, nothing less. Four words. Four words that caught Donald off guard. He looked at me as I knelt down beside him, and I asked him again. “What’s your name? Mine name is Brittany.” I wondered how long it had been since someone approached him and asked him that question. I wondered how many people had hurried past him to avoid any discomfort they would feel by Donald’s presence or question for change. Their discomfort. Wow, even typing it I feel the conviction of those moments I rushed passed those far more uncomfortable than me in their day to day lives. Thankfully, Donald reminded me of the promise I made to myself long before this exchange. He responded and told me his name. I asked Donald why he had the bandage on his head and one that I could see upon closer inspection wrapped around his ankle. 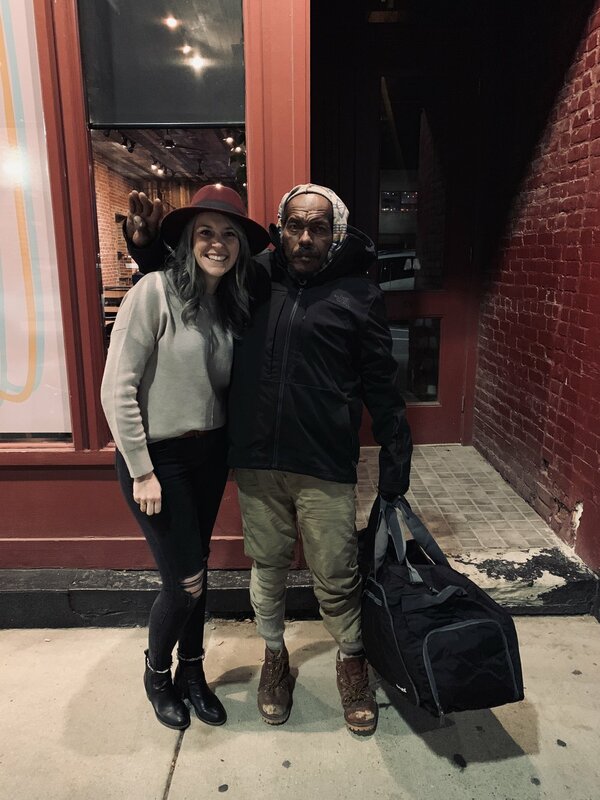 He dove into a long story about frost bite, abuse, and the culture around homelessness that he has experienced. He lost all his toes on his foot during last winter and was jumped in a park one night for the pillow that someone had given to him. I remained bent down beside Donald, looking him in the eyes and quietly listening to his story. I could see pain and heartbreak in Donald as he retold these moments, but the beautiful thing was there was no anger to be found. His tone was soft and sure yet to the point. I could hear no embellishment or grandeur added for effect or flair; no attempts at swaying my emotions to make me feel compelled to give him more money. Yet there I was, compelled and emotions swayed not to give money, but to give Donald more of what I did have-my time, my attention, and my respect. A few months ago I saw Donald and I asked him how he was doing and what needs he had. He told me he needed some good boot socks, new boots for the prosthetic he was having made for his foot, and a pillow and blanket if I could manage. I asked Donald if I could take his picture and share it with all of you to see if I could find some help; and he was more than happy to pose for me. I told Donald when I would see him again and hopefully have some of these things for him. So many of you responded with such generosity for Donald. He was able to get a new jacket, socks, a bag, pillow, shirts and jeans, sweaters, bus passes, gift cards for coffee and food, etc. He was beyond thankful. He asked me to help him put the jacket on immediately and as we took our picture together to show all of you how well he is doing, he was so excited to tell me how to pose with him, to see the photos on my phone, and choose the one to post. Donald acted how any of my other friends would have been when taking pictures together. We were laughing and having a good time catching up with each other. See, so many people ask me what I think about homelessness now that I’ve moved to the city. “How do you know who to give to and how do you know they won’t do something bad with the money?” The answer? I don’t. But that scenario of thoughts I ran through earlier? I had changed that in a moment when God reminded me of the humanity and dignity that every human being has, no matter where they live or what they do. Every human has intrinsic value because God says so. God asks me to use discernment and wisdom, but God also calls me to the highest level of love. “Love God and love God’s people.” The greatest command (paraphrased) and I learned one of the easiest ways to love people is to see them as people. It’s one of the easiest ways to love but also one of the biggest things we struggle with. We see what is different, what is “other,” as intrinsically bad or something to be avoided and shunned. But the moment people who are different become shunned, is the moment we have a much bigger problem. I realized I was shunning the image of God. I somehow thought I had the power and right to say who was worth my time, attention, and respect. I couldn’t live with that thought anymore. So, I changed my thinking, because my thinking and response is all I can control. I can’t control how people will spend the help they receive, but I can hope for good choices to be made. I can be wise and discerning as best as I can when loving and giving. But I have come to rest in the truth that when I stand before God at the end of my life, if I can say that I loved people the best I knew how in any given moment; I believe that God will honor that. Donald reminded me of an important lesson and promise I made to myself and to God. The promise that even if I have nothing of monetary value, I will stop and ask a simple question. I will ask the question that has proved time and time again to move mountains. Loving people doesn’t have to be grand and big, sometimes it is small and simple and just as powerful, if not more. Asking a simple question that can move the mountains of stranger to become the resting place for friends. Donald. Donald is his name. To all who gave to Donald, thank you. Thank you for blessing my friend this winter season. Here he is in all his gear, so excited to show off all that you gave.